33. Christopher Hirsheimer and Melissa Hamilton- Food royalty. Hirsheimer (yes, she’s a she) co-founded Saveur and shot all its food; Hamilton ran Saveur’s test kitchen, and is sister to Gabrielle, of restaurant Prune and memoir Blood, Bones & Butter fame. Now they run Canal House, the indie food magazine and book imprint. I didn't know their names, but I'm more than familiar with their work. Saveur has always been my favorite food magazine. I carry it along with me when I drive to visit friends and family. I've been known to convince people to get a subscription by pouring through the articles and the recipes and then cooking something up with them. But through all that, I still didn't recognize the name Christopher Hirsheimer as being one of the founders and executive editor. Or Melissa Hamilton who ran Saveur's test kitchen and was the food editor. Hirsheimer also served as the food and design editor for Metropolitan Home magazine. She's a writer and a photographer. Hamilton also served as the exective chef at Hamilton's Grill Room (Lambertville, NJ) which she co-founded. Together they joined forces, giving up life in New York and opting for a "simpler existence" to form Canal House Cooking. The Canal House series celebrates fresh ingredients and features recipes for cooks at any experience level. Christopher photographs the food for the book, as well...and I see that Melissa does the illustrations. Canal House Cooking volume 7 is subtitled La Dolce Vita and features food from Italy. Though they'd both been to Italy before, "they decided to rent a rustic old farmhouse in Tuscany with a long table for dinners outside, a grape arbor, apple and fig trees, and a spare kitchen with a classic waist-high fireplace with a grill". Sounds like my idea of heaven. This tart is slightly adapted from this book. Mix the flour, sugar and salt together in a large bowl. Add the butter and work it in with a pastry blender or your finger tips until mixture resembles wet sand. Lightly beat the egg and yolk together. Add the eggs and wine (or vodka) to the dough until it just holds together. Be careful not to overwork or dough will be tough. Wrap in plastic and refrigerate for at least 1 hour. Roll out two-thirds of the dough on a lightly floured surface to an ⅛-inch thickness. Wrap the dough around the rolling pin, and lay across a 9-inch tart pan with removable bottom. Cut off the excess. Prick the pastry bottom all over with a fork. Spread jam over bottom of tart. Roll out the remaining pastry on a lightly floured surface. Cut dough into ¼-inch wide strips. 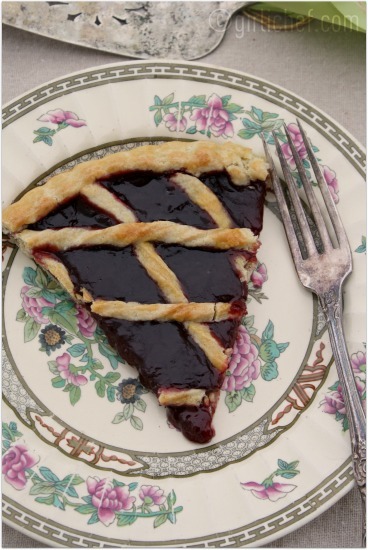 Lightly twist and lay the strips in a diagonal lattice on top of the jam. Trim the strips to just inside the tart shell, then gently press the outside edge of the crust down over the ends of the strips. Brush pastry with egg wash.
Bake until golden, ~25-30 minutes. Remove the warm tart from the pan and allow it to cool on a rack. This is so pretty! I like Gerry's idea of licking out the jam and then eating the crust. I'd like to try yours right now. 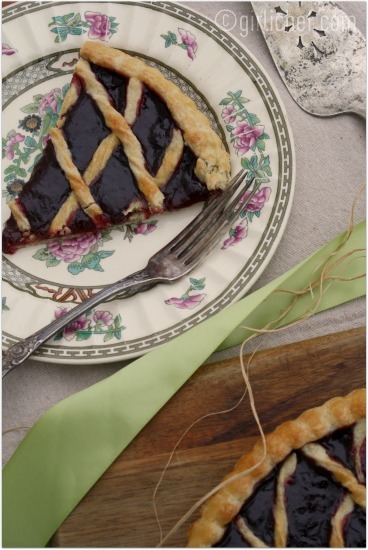 I remember making jam tarts with my mum when I was little, but they never looked as elegant as this lattice one! Seriously cant take my eyes from ur irresistible click,super tempting tart. Such a beautiful tart! I could go for renting a farmhouse in Italy...How wonderful would that be? I love the simplicity of their recipes. I made the Tomato Tart and it was simple and delicious! Just beautiful; wish I had your talent with photography. What a pretty tart to represent these two talented women by. I do like the simplicity of their recipes and the use of fresh whole ingredients. Sounds like they have the idea life doesn't it? SO delicious!!! And your lattice work is stunning!!!! Wow. Really a fun recipe! Most of us would have the ingredients already in our pantries too. 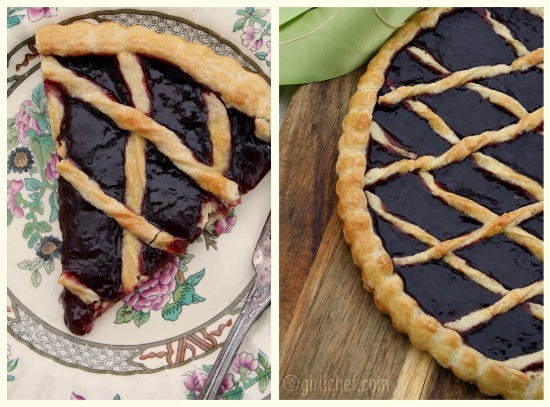 Love the way you've twisted your lattice crust. I'm going to do that next time I make a pie. Es una tarta perfecta y completa luce deliciosa ,excelente elaboración,felicitaciones,abrazos hugs,hugs. So simple but elegant, I love those twisty bits, they really add so much. I like this because I've been seeing such wonderful inventive jams lately, and it seems a shame to limit them to toast. Beauteous pastry and pretty photos... I like jam tart, too and have made Dorie Greenspan's in the blink of an eye when dessert just seemed totally the way to spend the afternoon. This one is a great way to use some of that jam I got at Christmas for gifts; I'll never eat it all on toast. Que color tan bonito, una delicia. Some beautiful clicks...and the pie looks delish too. I had a jam tart every day in Italy. It was such a welcome start to the day. I love how different they all are - but always so pretty and such a welcome start to the day. Your creation really shows off the these two extraordinary women and their recipes. And the possibilities are endless. The criss-cross turned out beautifully. The pasty looks so tasty you really chose a great recipe to make. I'm always learning something new, always introduced to new chefs. I had not heard of Melissa Hamilton before this post. Fine looking tart. Wow Heather, how very impressive! I cant make crust. Mine never comes out right, so I usually use pilsbury. It is interesting that they put vodka or wine in with the crust. They seem to add odd things to their recipes that you would normally not think of. Great Photography as always. Thanks for sharing with us. I didn't recognize the names either, but Canal House? now THAT I've heard of. Oh how I want a nice sliver of this tart. I think it would be perfect for a midday work break, no? Rica y fácil receta! me encantó el plato, me gustan así! Looks beautiful. 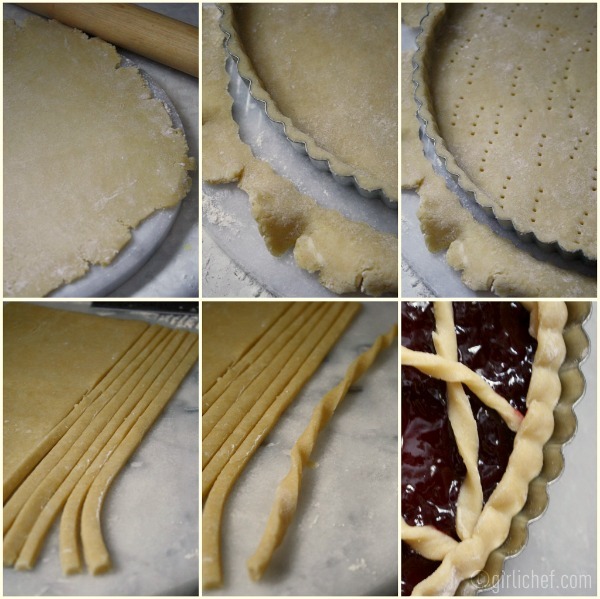 I love your step by step photos for the pastry. Bison Grass Vodka? I've never heard of that before but it's surely intriguing! I love how simple this recipe is yet I'm sure it tasted oh-so-yummy! I can never get enough of tarts of any kind! Great write up and gorgeous jam tart! sweet tamales to a jam tart.. perfect Vday treats!! Absolutely gorgeous. I happen to have a ridiculous amount of jam kicking around from developing a line of natural jams an jellies. This would be a great way of using up the ones I won't be selling! Thanks for this. Brilliant idea.